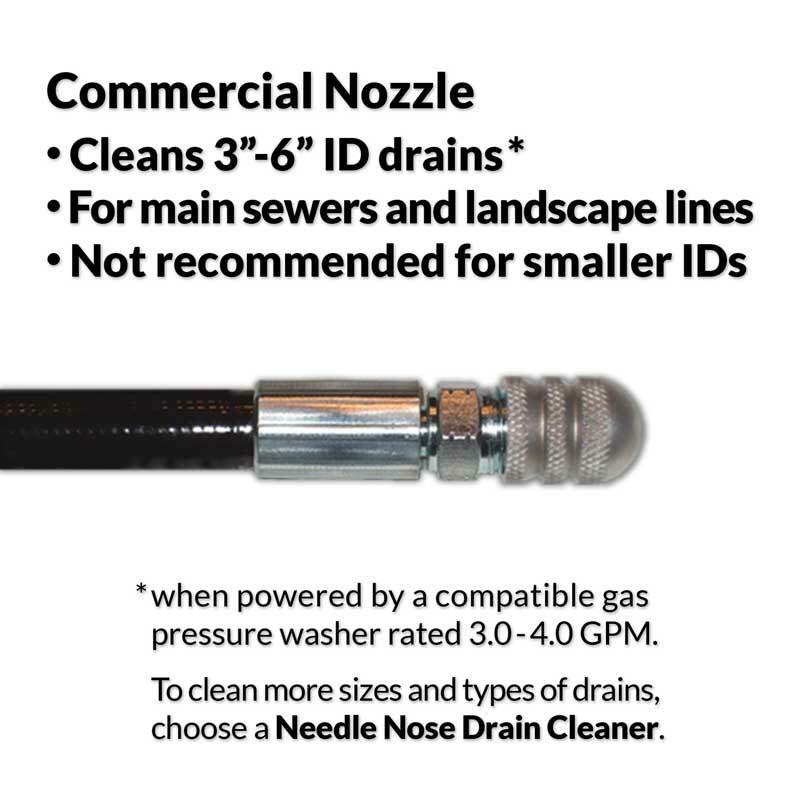 Powers itself into 3" to 6" ID drains— not recommended for other sizes. Complete and ready to use, with an adapter to fit most gas machines. Precision stainless steel nozzle for faster cleaning and penetration. Professional grade sewer jetter hose is wear-tested for durability. Includes a double-headed hose tie to keep your drain cleaner coiled after use. 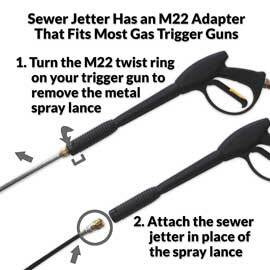 The M22 Male adapter on this drain cleaner fits the original trigger guns on most cold-water, gas-powered machines. You can click for a list of compatible brands. 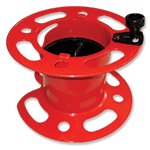 For most machines, choose For Most Gas Machines - M22 Male Adapter on this page. High Pressure Line OD: 0.48 In. Special-purpose high thrust nozzle for extra pulling and flushing force. 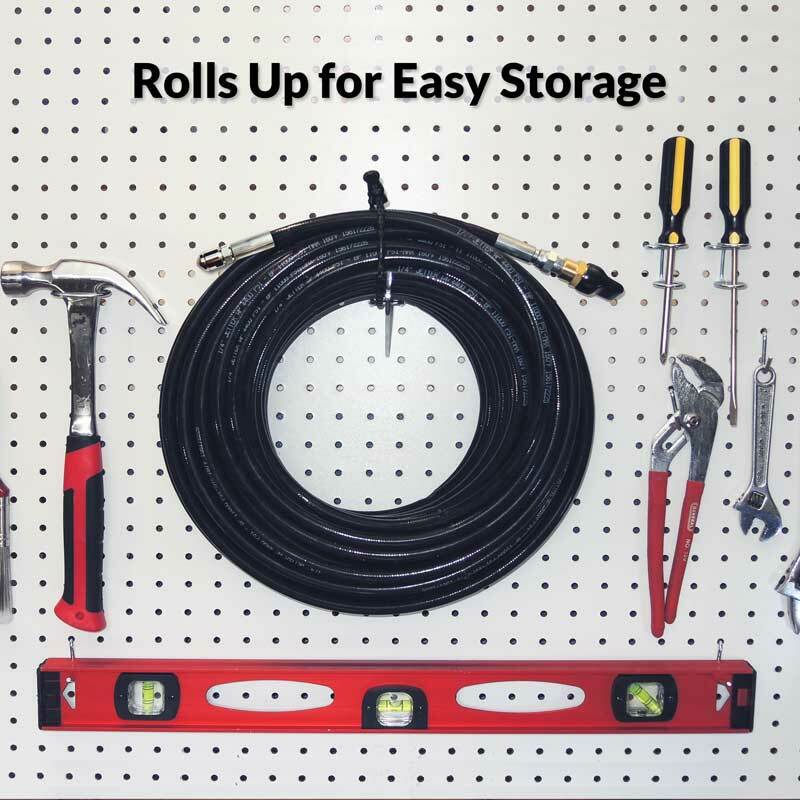 Roll up and store your drain cleaner after use. Standard spare nozzle and free accessories. Clog Hog did a wonderful job , the powerful jets push the nozel head without any difficulty what so ever, had a 100 ft pipe run with a lot of bends, cleaning the piping perfectly, and save me a lot of money from a Comercial plumber doing this job. We had a severley clogged toilet. Tried plunging, snaking, power snaking, chemichals. Nothing worked. Called the plumber and and he run his camera through the line. It was seen to be a soft clog. Feet of hung up toilet paper. It's like oatmeal. You put the snake through it and pull it out and the clog just closes right back up. He said it would have to be hydro-jetted through the roof vent at a cost of $1350. 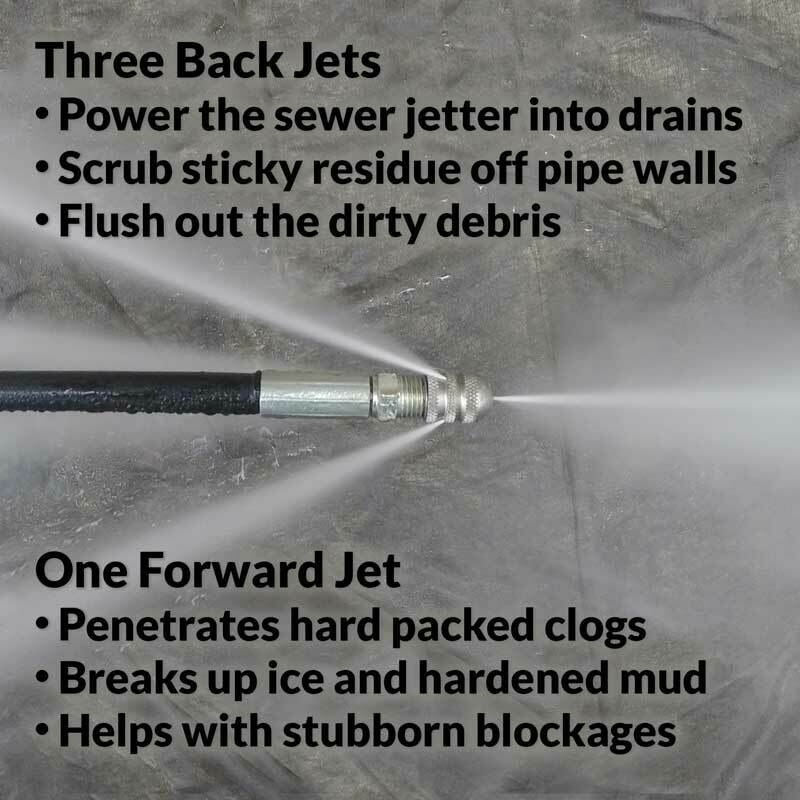 Well I came across the Clog Hog and bought the 100 ft, commercial 3.0 - 4.0 GPM jetter for $150. I don't have a pressure washer so I rented a 3.5 GPM pressure washer for $65. Took a few minutes to set up. Took the toilet off again and ran the Clog Hog in. The thing pulled itself in and made its way to the clog. Well I learned the hard way why the plumber wanted to go through the roof vent. LOL! Everything backed up into the bathroom. It was a mess but my wife and I contained it the best we could with towels and such. I would let the jetter go till it stopped and pull it back and let it go again and it just kept throwing back more sewage. About 20 minutes in I was about to give up when there was suddenly a huge whoose and it drained. I couldn't believe it! Yes we had a mess to clean up but the Clog Hog saved us nearly $1200. Awesome product. Highly recommended! I originally placed an order for the 150’ reel system. Received a phone call from the company and after a very great educational discussion they talked me into a less expensive product and I’m glad they did. They saved me about 300 dollars and it works great. 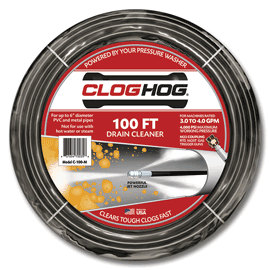 I have been using the Clog Hog drain cleaner for years. It is the best product I have found on the market. I bought this to clear out my drain pipe that runs from my driveway and drains into the yard, but it had been clogged by leaves, and sticks and other debris. I was a little skeptical that I would be able toget the Clog Hog to run the length of the pipe. I was pleasantly surprised by how easy it was. The Clog Hog almost pulled itself along the entire length of pipe with me actually holding it back a bit to slow it down. The pipe is flowing nicely and the Clog Hog really lived up to its reputation. Great product. I would definitely recommend buying it. 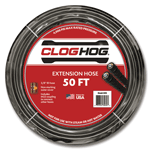 We bought this Clog Hog 100ft Commercial Drain Cleaner a couple of months ago. It's been proven really useful since we already have a powerful power washer. We are using it for preventive maintenance. It has already paid for itself in this short period of time. Highly recommend it! I haven't used it yet, but it looks like excellent quality for the price. 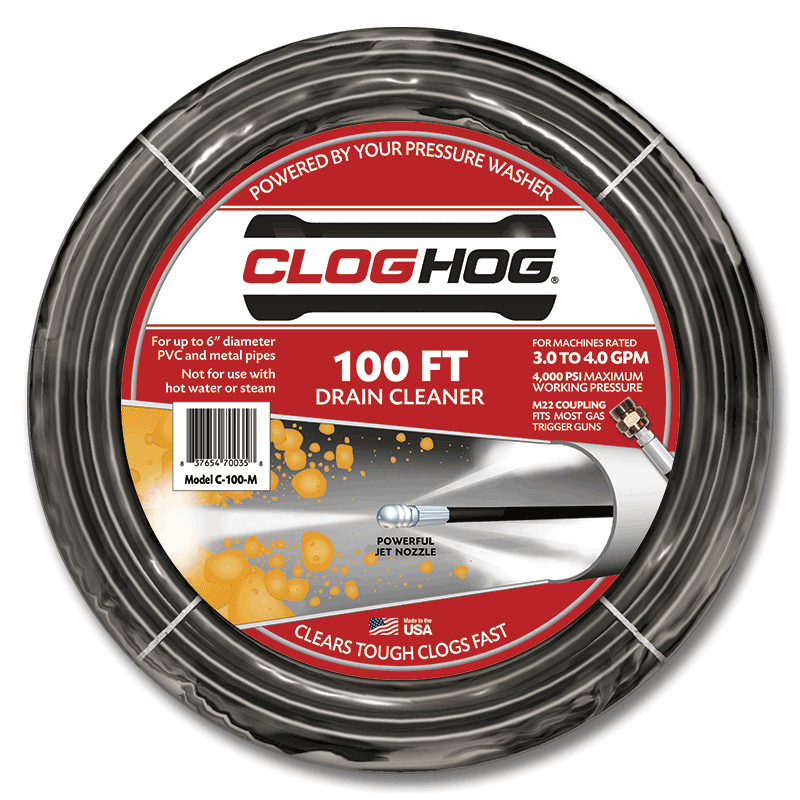 The Clog Hog saved me a ton of money, because I was able to clear the drain tile around my basement, without having to excavate. I realized I had a blockage about 20' back from the corner of my walk out basement, so I used an excavator to remove the soil from the side of the foundation. I ran into something that prevented me from digging far enough back, so I could not uncover the blocked area. I was just getting ready to call in the heavy machinery professionals and spend $20,000 to have the drain tile replaced, when I came across the Clog Hog. I figured for less than $200.00 I would give it a try, and it worked perfectly. This is probably the only product that would have worked since, all other methods would have destroyed the black, plastic, corrugated pipe. Thanks for a well designed product and fast shipping. Purchased to help save cost of hiring a plumber to clean drains at my family owned restaurant. Product performed as advertised and it paid for itself on the first time it was used. We used the 100Ft Commercial Drain cleaner to clear a completely clogged 4" line (yikes) 120 Ft working from one end then the other until it was as clean as a whistle. Thank you for such a fabulous tool! Use this clog hog for my 4" drain tiles through the perimeter of my basement. Have 4 clean outs that I have access to the complete tiles. I have a big problem with silty sand that enters my tiles and needs semi annual cleanings. Use this Clog Hog and pulls the sand back to the clean outs where I can remove the sand by hand. Then i do a complete clean out from both entries to the sump pit and I'm back in business. 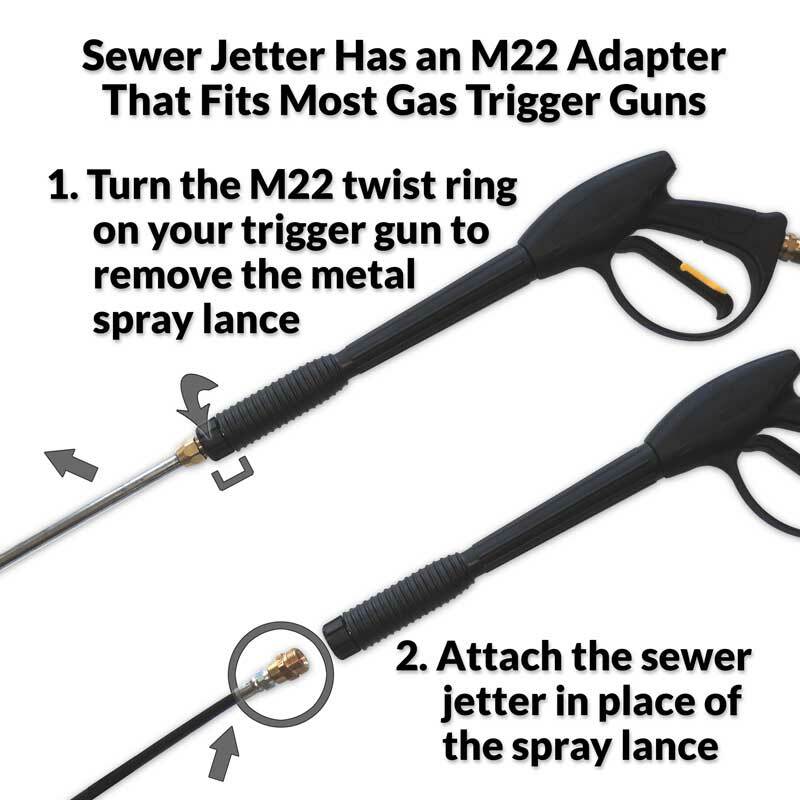 My son bought me this jetter and it is great. I've already made my money back! Worked great for cleaning a clogged section of field tile. Jay, thank you for your comments. 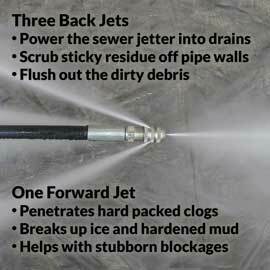 As explained in on our product labels and demo videos, it's important to flush out the garden hose and pressure washer hose each time with clean water before you attach the sewer jetter. That's because dirt and small debris can enter the open ends of these hoses during storage and transportation, and will make their way forward to clog the nozzle tip. There's detailed information on our FAQ Page about cleaning the nozzle should it get clogged. I bought the 100 foot I made my Money back on the first job they do a fine job and well worth the money. Will Buy again 5 star all the way. Perfect for small or larger jobs. Cleaned all my gutters easily also! Love it!! The driveway of the house we bought had a 4 inch PVC drain pipe under a grill to prevent a 2 foot puddle at the top of our driveway. Our driveway is at the end of the street, and collects all the runoff from the entire street. The drain had become clogged with pine needles, leaves, and mud from all the trees of the neighborhood. After 4 months of trying various ideas and failing, I successfully cleared the drain on my first attempt with the Clog Hog. The forward jet cleared the debris, and the rear jets washed the debris backward while pulling the hose forward and around corners. It worked very nicely, just like it was advertised to do. I'm glad I have it. We had the main sewer line back up a few times so we decided to give the CLOG HOG a try. I hooked the hose up to my pressure washer and dropped it in the vent pipe by the street. The hose made a 90 degree turn towards the house and after a minute or so it cleared the pipe out and was willing to go right into the house. Literally opened the cleanout inside afterwards and it looked like a brand new cast iron pipe. Thanks to CLOG HOG. 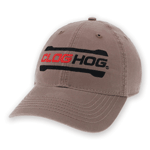 We purchased the Clog Hog to clean a small storm drain that ran under a building. After following the easy to follow instructions I found the Clog Hog performs exactly as advertised. It pulls itself in the pipe cleaning all material. To date we have not been called back for this issue. 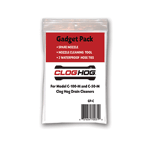 I purchased the Clog Hog as a last resort to an issue I've been having for 4 years of flooding my garage floor every time it rained. I couldn't believe it actually worked so well. I had an underground drain from a house built in 1954 that was plugged solid. I only had to work on the drain from the downside of it for about 1 hour when it finally let loose about 60 feet in. You'll know because dirty water will come out the pipe, you'll see it. Take your time, once you get to a clog you'll think it's either a corner you can't go around, or a clog. You can't see it so just keep working at it and pull the hose in and out about a foot or so, keep doing that, if it's a clog, it will go through in time. This thing worked great, one of the best tools I've ever bought and I have a lot of them. Thanks Clog Hog for a great product. Ran this down 75ft. of my 4" sewer line and cleaned it in a "snap"! Love it, Great Tool!! Walt S.
I had a silt-filled underground driveway drain which was almost totally blocked. It took a while, but the Clog Hog cleaned out a ton of silt and opened the drain. I would highly recommend this product to anyone with drain problems. Joseph, thank you for your review. 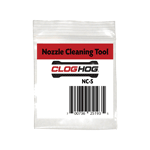 Note that Clog Hog offers an optional High Thrust Nozzle that's designed to provide twice the scrubbing and flushing force to help clear out heavier yard debris and sediment. 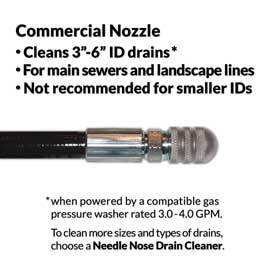 The High Thrust Nozzle has no forward jet, so it's not recommended for drains that could be completely clogged. I purchased a similar tip from a local shop and have used it with mixed results and messy struggles. The Clog Hog worked so much better that I had a hard time believing it. Very self feeding, hose is tough and slick. I have cleared several exterior drains with it to date. Very happy customer. Was easy to order and arrived very quickly. Was easy to set up and use, quality product. Love how handy this machine is, makes things much easier on small jobs or large ones!! Product is great and easy to use! It has saved me from having a plumber unclog drain lines at my rentals. Which means saved me money, thanks! Not only did our CLOG HOG open our 6" drain line for our Car Wash but since we use it now to maintain and clean the line every other week. Used the clog hog in our commercial building, was having a lot of sand/pumice build up in our drains, especially near hand wash sinks. Worked great,drains are flowing nicely.